I woke up this morning, and as the sunlight crept through the cracks of my curtains, the realisation struck me like a hammer, prompting me to open my eyes wide, after I’d swiped my phone alarm onto the floor. I’m Eight. 8. 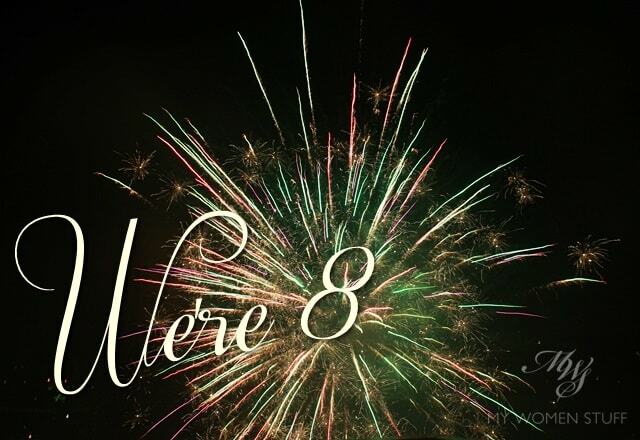 I, Paris B, am 8 years old today. Naturally, in human years I’m not (I’m a lot older) but my blog existence and online persona today celebrates the 8th year of existence, with just as many hiccups. As I do at this time, I tend to reflect on how I’ve survived the blogging jungle and what I would do or do differently. In my 6th year I confessed my blogging sins and in my 7th year I talked about passion. I didn’t know what to talk about this year, because I almost didn’t make it to my 8th. I’d toyed with the idea of closing the doors and drawing the curtains last year. The feeling lasted a while, as I tried to get to grip with things. Perhaps, what I wanted to deal with was disappointment and failure and not a small amount of frustration with the way things were going. But then, I realised just what it was that I had, that I knew would carry me into my 9th and hopefully 10th year of blogging. Yes, you. You, reading this blog post. You, who write me emails of quiet support, and ask me questions and force me to think of the right answers. I appreciate your trust in me and it frightens me sometimes when people tell me they trust my recommendations, because I’m not a trained expert. I can’t tell you if an ingredient is good or bad, or if your oily skin would benefit from using XYZ product, or how to apply eyeshadow without looking like a panda. I can only tell you what I have experience with and I never know if that might translate to the same experience for you. Yes, it frightens me to bits. You, who most recently, subscribe to my email newsletter and who reply and ‘talk’ and respond to my email newsletters, telling me about your experiences, your day, your festive preparations, and sharing your plans and fears, and hopes and dreams. (I have Tine to thank for giving me the push to start the newsletter) It’s my fortnightly highlight to send it out and receive your responses. You uplift me, you make me smile, you make me think, you give me blogging ideas, you frighten the bejesus out of me, but although I say that I blog for myself, I and MWS would not be celebrating our 8th year of talking about beauty, skincare and makeup, without all of you. Thank you Lily 🙂 Yeah, 10 years is crazy, but hey, it gives me something to look forward to and a party to plan maybe? Haha! Well unless I get disillusioned again 😉 All the best in your blogging journey too! Congratulations and happy 8th! In this age where people are connected on the internet, MWS certainly feels like a friend to me (and many others, I’m sure). I’m glad to have had the opportunity to share your ups and downs which, incidentally, makes your blog so much more than just another beauty blog. The human factor behind it is precisely what makes MWS feel “real”. As a regular reader, I would like to tell you that I really do appreciate that. So, once again, many happy returns and looking forward to more valleys and hills with MWS! Girl!!! Happy 8 years — that is such a milestone. I’m glad you have decided to continue! You are one blogger who writes well (most of the sweet young things out there can’t write with proper grammar!) and remains true to the spirit of blogs, which began as online journals. I also like how you give fair and mainly factual opinions on products without having to stoop to a barely-disguised advertorial writing style. And since we are skin twins, I genuinely enjoy reading your skincare and foundation posts! Hope to meet you in-person one day. Happy Birthday, Paris B! Thank you for such an informative and well written blog. Here’s hoping for more! Cheers! Happy Birthday, MWS/PARIS B!!! I’m glad you’re still around and kicking! MWS is about one of the two or three beauty blogs I visit everyday, besides my kdrama recap site, to look for beauty info/entries. I’m thankful that you’re still blogging. I’ve come to really appreciate what you advise on beauty and life. You’re like a big sister to me, I feel, so thanks! Congratulations! I have been a silent reader of your blog for few months now which i stumbled upon while i was ‘googling’ about a product. Your posts helps me to get thru the train ride to and from work everyday sinced. I appreciate your efforts and your honest opinions and thank you for all the interesting posts. Oh Paris please do keep up your blog! Your blog was one of the blogs that I connected the most, not just because of the reviews, but honesty and sincerity were so prevalent in your writings that I enjoyed every single one of them. It was truly wonderful that I had a chance to become your reader some 5 years ago, and some of your jokes really do crack me up! (diddly squat, loved that term 🙂 And the comments that you personally replied? I was thrilled every time I had your reply 🙂 It’s not just product reviews that you have just posted, but also reviews in life. And I appreciate every single word/pictures that you have communicated to us via either blogs or instagram(a good photo does lift the day!). Thank you Paris, Congratulations and Happy Turning 8! Thank you Tracy and I’m so glad we have each other to moan to about our down times too! Haha some day we have to meet!! Hip hip hooray for 8th years and more to come! You have made the best choice ever to start this blog to begin with! Lots of hugs! Your blog is one of the most honest and well written blog i’ve ever read, and we can alway count on you to provide those true reviews ( no good means no good!). Congratulations, what a milestone! Here’s to many more! Congratulations and Happy Blogging Birthday! Glad you decided to stick with it.